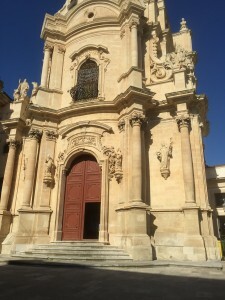 The Duomo at Siracusa was such a beatiful example of the seamless welding together of two histories. 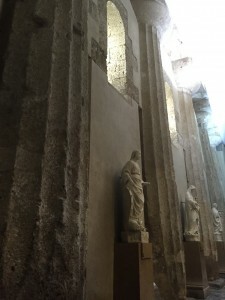 You can see the remains of the Doric columns which have been worked into the walls of the modern cathedral in a peripeteral style. I loved the contradiction between the ancient history and the baroque architecture in this cathedral. It seemed to capture for me the nature of Sicily as a series of contradictions, with roots of its culture from ancient Greeks, Arabs, Normans, and the Catholic church, the dominance of each culture fluctuating over the centuries to leave behind a breathtaking tapestry of values and artistic styles that have now blended together into a truly Sicilian cultural identity. Coming into this trip with a previous knowledge of Sicily (Syracuse especially) via its ancient coinage, I was particularly excited to see the Spring of Arethusa. This deity is depicted on most (if not all) of Syracuse’s ancient money as the patron nymph of the city. Arethusa, as the nymph of a fresh water spring, held special significance for the Corinthian colonists who founded Syracuse. Access to fresh water was (and still is) indubitably one of the foremost priorities of any new city, and according to the mythology of the Greeks, this spring acted as a link to home. According to the legend, Arethusa had a spring in Greece but was pursued by a male river god, so she ran from him and finally escaped upon arriving to Sicily. Thus, she (like the colonists) had roots to the motherland of Greece but had firmly established herself and was flourishing in this new land. 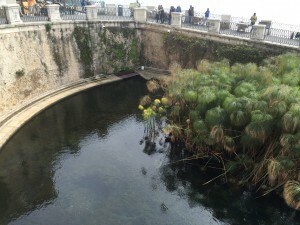 I was thrilled to see the spring which had held such significance for the ancients. It was one of those unforgettable moments where you come face to face with history and for a moment, and suddenly everything you’ve studied feels tangible again. 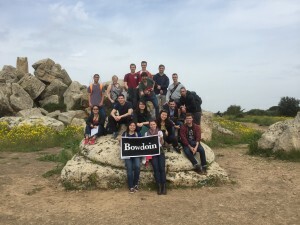 It was really exciting to learn about other important periods of Sicilian history, such as the explosion of Baroque architecture after the earthquakes of the sixteenth and seventeenth centuries. All of these beautiful little towns had enormous baroque cathedrals that existed so unassumingly in the makeup of the town. They reminded me of the similar function temples must have held in the ancient world. Indeed, both cathedrals and temples seem to hold similar positions in the fabric of the city. Aside from the obvious parallel of religious function, both places of worship are constructed on an incredibly grand scale, likely for the purpose of inspiring awe in the observer/worshipper. Indeed, both the Baroque and Doric architectural styles seem to ascribe to the same principle: if your religious building is beautiful and awe inspiring, your deity which you worship is that much more powerful and worthy of respect. Similarly, it seemed to me that fine architecture was not limited to main urban centers, as one might expect in a modern city with non-religious buildings. Small towns all over Sicily (from modern Ragusa to Modica, from ancient Segesta to Selinunte) were in possession of large, artistic religious buildings where (or near which) worship could take place. I think this speaks to the significance of religion, both in ancient and modern Sicilian culture. Towns were more likely to spend money on beautifying the edifice of a religious site, rather than on public construction for governmental purposes, etc. Personally, I find this connection in community priorities fascinating and would love to have more time to research and learn about it. Selinunte was one of my favorite sites we got to visit on this trip. The beauty of the ruins of enormous Doric temples among the spring wildflowers was like a dream. The sheer amount of ruins, as well as the level of preservation of these temples was amazing. Moreover, it was incredible to explore a site described by Thucydides in his History of the Peloponnesian War over two thousand years before. Selinunte was one of the Greek colony cities – founded by members of Megara Hyblaea – which the Athenian historian explains, antagonized the city of Egesta (modern day Segesta). It was this conflict between Egesta and Selinunte which galvanized the Athenian decision to undertake the fateful Sicilian Expedition. Anyone familiar with this expedition will be familiar with its disastrous outcome (sites relating to which we got to see later on this trip!). This site was also a wonderful example of the historical differences in the construction of Doric temples which allow historians to date temples of this period. The column capital upon which the group is sitting comes from Temple G at Selinunte (it is upside down here), and as one can observe, the echinus (the fluffy hemispherical part we are sitting on) is less rounded, which dates the initial construction of this temple to 530 BCE. The architectural styles and refinements change throughout the ruins, indicating that this temple was under construction through the transition between the Archaic and Classical periods. 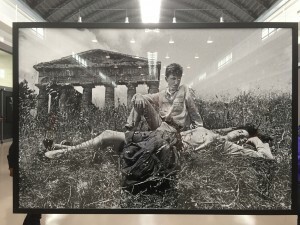 Our visit to the exhibit of Letizia Battaglia’s photographs at the ZAC Cantieri Culturali alla Zisa on our first day in Palermo was the first exposure I had to the incredibly complex nature of Sicily. Battaglia’s art captures beautifully the inherent disconnect between the romanticized ancient world and the gritty reality of Sicily today. Her images of mafia victims and the realities of daily life in Palermo in the last quarter of the twentieth century really spoke to me. It is easy to get lost in the romanticized ancient culture of the Mediterranean and to forget the reality of the society it exists in and informs now. I was incredibly moved by her unabashed documentation of human nature surrounding tragedy and injustice, as well as her eye for capturing the quotidian and making it as beautiful and attention grabbing as an ancient temple or a beautiful baroque cathedral.